The Arkansas Foodbank can accommodate volunteers groups of all sizes from families to larger groups. Volunteer opportunities include, but are not limited to, sorting incoming food donations, processing and organizing items for distribution, preparing backpack kits for children in schools, office work, delivering senior boxes, and assisting with our mobile distributions events. 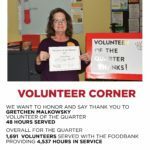 Last year, more than 11,000 volunteers donated more than 33,000 hours of time to help us in our mission of fighting hunger in Arkansas. Sign up to volunteer for any of our one-time events or one of our ongoing service projects. Use your talents to benefit Arkansas children, seniors, and families in need. Check out volunteer opportunities below. We look forward to you volunteering with us soon!